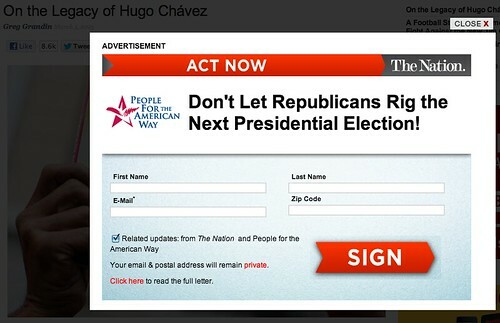 Hugo Chávez legacy: The Nation couples its story with an unfortunate pop-up ad. The Nation’s main comment on the death of Hugo Chávez adds to the decade-plus of apologias for the “Bolivarian” revolutionary. (If Americans knew more about Bolivar’s style of governance, the name-check would have been a warning all its own.) This seems to be the line causing the most agita. There’s been great work done on the ground by scholars such as Alejandro Velasco, Sujatha Fernandes, Naomi Schiller and George Ciccariello-Maher on these social movements that, taken together, lead to the conclusion that Venezuela might be the most democratic country in the Western Hemisphere. Not that interesting on its own, but when I clicked to read through, I got this pop-up ad. Guys, no need to take advice from a notorious beachhead of neo-liberalism and contrarianism, but drooling about Chávez’s committment to democracy does no favors for your (really excellent) reporting on voting rights in the United States. Read more of Slate’s Hugo Chávez coverage.